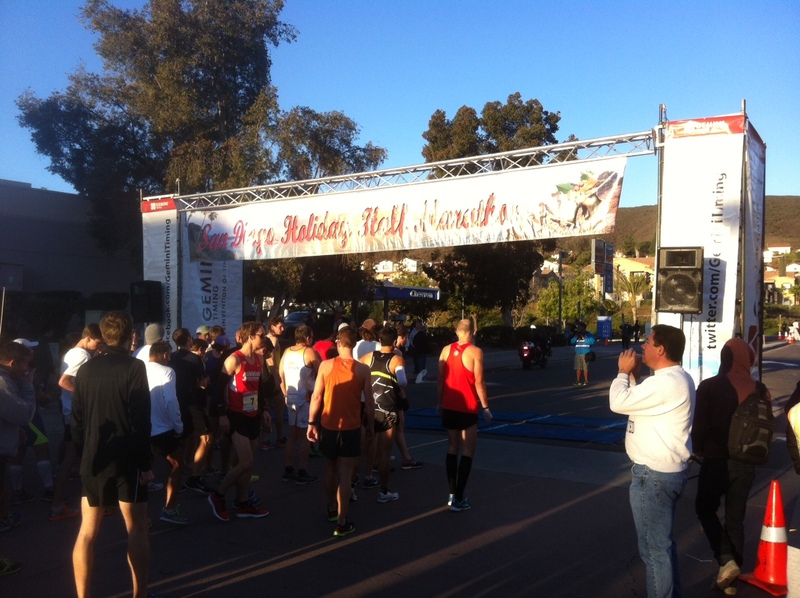 The San Diego Holiday Half Marathon was a great finish to the year. In total, I ran 13 races this year, some for fun, some for a PR, some with friends and some alone. Each were great in their own way. 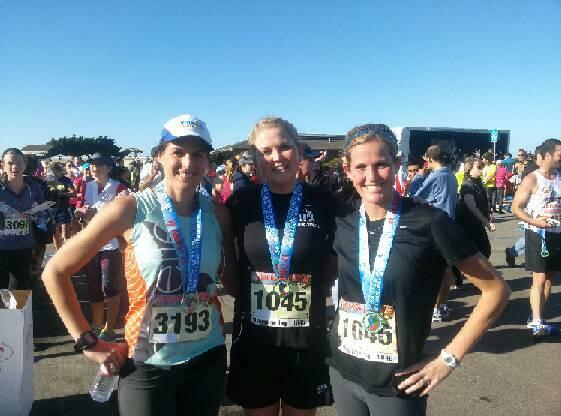 The San Diego Holiday Half was run with a friend to celebrate our birthdays and was really fun! My friend Brooke’s birthday is December 30th and mine was the 25th and we both appreciate the fact that it’s freaking hard to celebrate a birthday with your friends and family around the holidays. 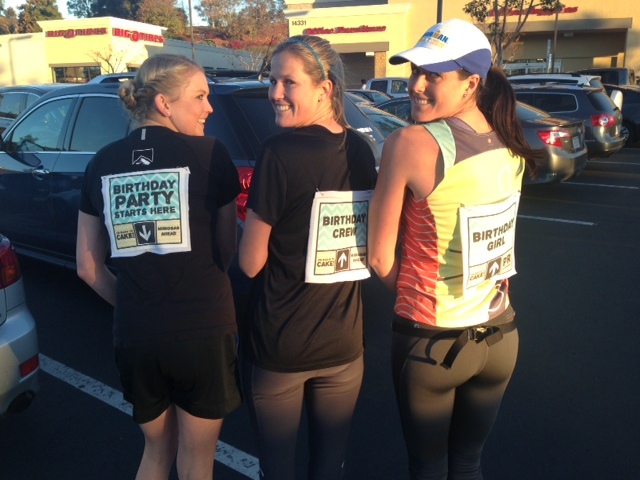 We decided to have our own party by running a half marathon on December 29! Brooke made adorable signs for us to pin to our backs which announced to all that we were in fact celebrating. She made one for each of us, including her sister who was also running the race. As soon as we put them on people began to wish us a Happy Birthday and it continued throughout the entire race. Given the 10 miler + 10k race last weekend and a week following of drinking and indulgences, I wasn’t expecting miracles at this race. 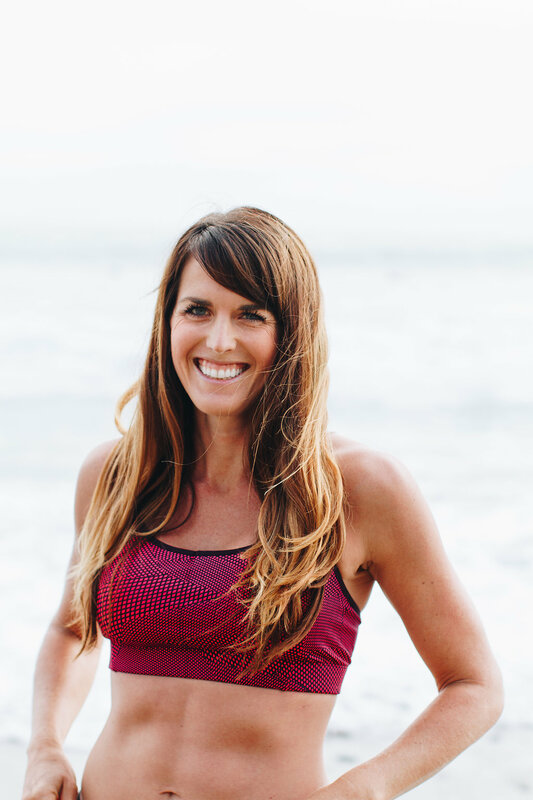 I did know that the course was a net decline so there was some good potential there and I also knew that I performed better than expected at the 10k, so I set what I thought was a realistic goal for myself – to finish under 1 hour 45 minutes. 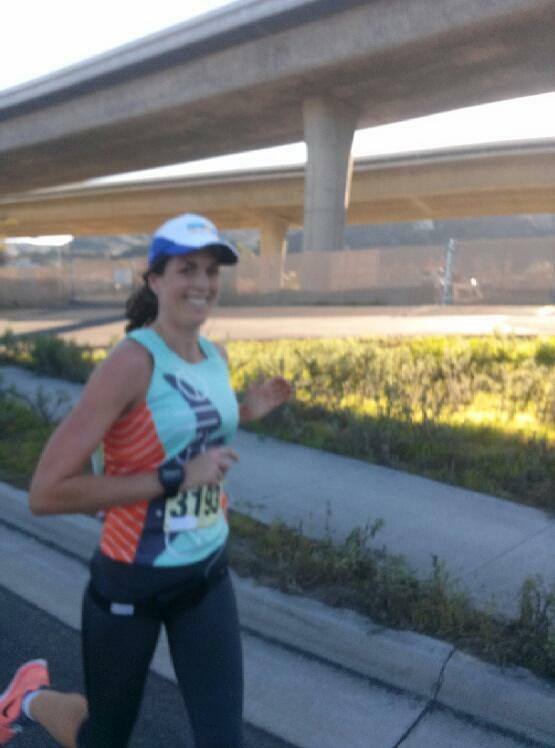 My B goal was to finish under 1:47:30 which would mean I was running the race at my BQ pace. In the back of my mind, I wondered if a PR was in there, but I didn’t really believe it. Maria, my coach gave me absolutely no guidance on pace for this race. Since I have been training with heart rate only in mind, I race with heart rate in mind. The plan was to run the first 1-2 miles in Zone 3 and then pick it up to Zone 4 for the remainder of the race, until the last mile where if I was able to, I could kick it up to Zone 5 for the finish. Mike got a photo of us at the start! Although I did set the 1:45 goal for myself, I surprised myself by not paying attention too much to pace during the race. As instructed, I was to start out easier and I did. Although the course is a net decline of 700 feet, the first few miles are full of rolling hills, in particular a significant climb right before the 1 mile marker. I didn’t charge the hill as my pace slowed, instead I just steadily climbed it, knowing that going too hard early could destroy my race. A woman came up next to me to pass up the hill and said Happy Birthday and asked how old I was. I said 30 and she said, “So young! You have plenty of time” and said she was 52 years old. She looked amazingly fit and definitely not her age and then blew by me up the hill! My inspiration! Shortly after we got onto the 56 bike path which runs parallel to the 56 freeway, which runs East/West and connects the two largest freeways in San Diego. Although it doesn’t sound scenic, and it’s not, it actually wasn’t too bad of a race course. When we first got onto the path it was very crowded. Since I had been slowing down for the hills and others were charging up them, I was eager to pass now but it was difficult. Brooke’s sister charged ahead through the crowd and we got held back and lost her. Brooke and I did some swerving around runners especially on the downhill for the next few miles. On the uphills though, we’d get passed back as I slowed to keep my heart rate under control. I wasn’t feeling great in the beginning of the race. Luckily mile 4 was the best because it was a very long decline with basically zero inclines. I shouted to Brooke, “I love Mile 4” and we cheered and I got into a better mood, especially when my watch beeped and announced that we’d busted out a 7:19 min/mile without much effort. Miles 5 and 6 had some rollers and I started to get some negative thoughts about the race, my fitness and the upcoming marathon. I knew that I still had more than half the race to go and I wasn’t feel great. I wasn’t really surprised based on the week I’d had yet was also disappointed that I wasn’t feeling better. Brooke could sense my thoughts and kept encouraging me to pick it up and telling me that I had a PR in me. At this point, I definitely didn’t believe her. Somewhere around here is also when we saw Mike as we were going up a hill and he later told me I did not look very happy! Brooke kept trying to convince me that we should start to pick it up but I kept thinking I wasn’t ready. Around this time we passed by volunteers handing out gels and I realized that I hadn’t taken any fuel! I got worried when I noticed over 55 minutes had passed (I planned on taking a Gu at 35 minutes) and took the Gu and told Brooke after we crested the hill I’d be ready to go faster. Once we got over the hill we picked it up and pushed the pace, getting faster as we went. I started to feel better and up ahead we could see a pace group which I was pretty sure was the 1:45 pace group. We kept making time on them until about 1:10 when I decided I needed another Gu (this was the time I was supposed to take one had I taken the first at 35 minutes). I slowed a bit to take it and within minutes I started to feel really good. Feeling good toward the finish! Somehow, around mile 10 I got a second wind. 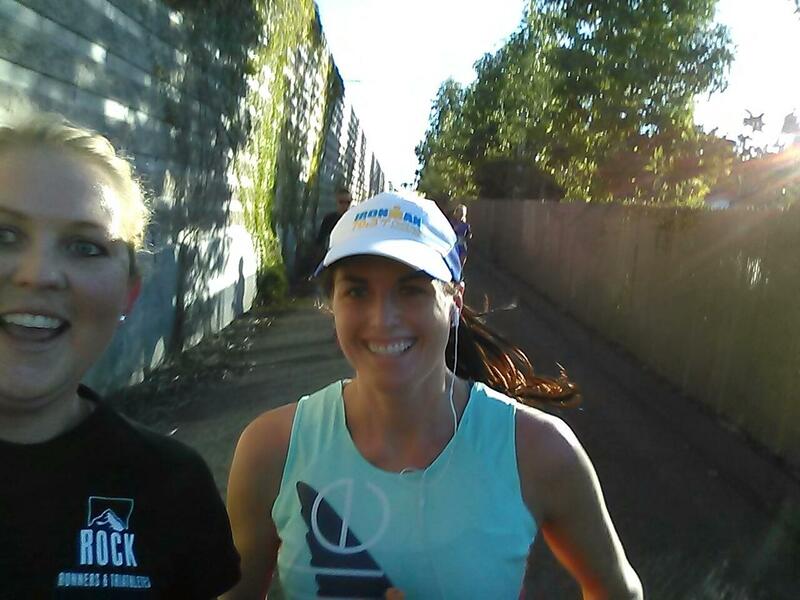 Rather than questioning Brooke’s prodding about our pace, I started to believe that we could do it. We were in the home stretch and I was feeling great. Our pace dropped and soon we were passing people left and right, many of them cheering for us and wishing us Happy Birthday. Finally, we passed the 1:45 pace group (which wasn’t much of a group anymore) and I cheered and the pacers cheered for me. Brooke got a great photo of it happening and the whole event really boosted my spirits. Cheering as we passed the 1:45 pacer! The closer we got to the finish, the faster I ran. I felt amazing. The end of the course doesn’t have much in the way of a net decline (I believe the majority is from miles 4-10) but despite the flat terrain I was flying. For a second I really believed I could PR. 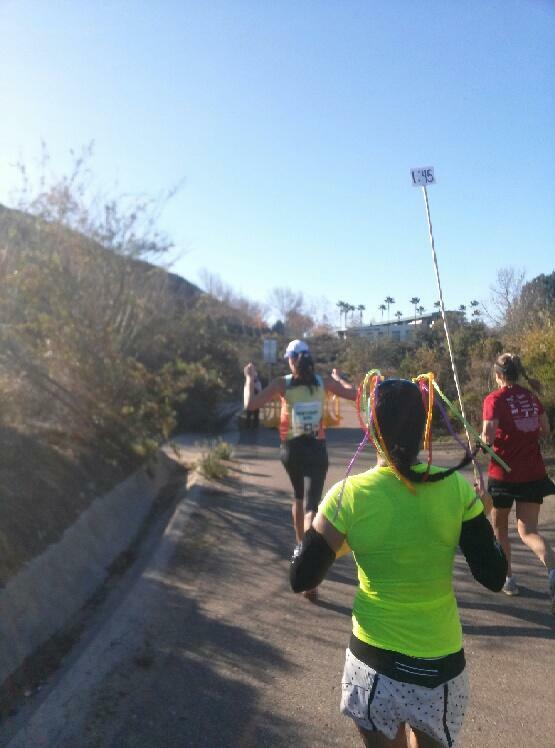 I kept pushing as we neared Torrey Pines State Beach, where the finish was held. The race directors put a little out and back just before the finish which I’m sure wasn’t exactly welcomed by most runners but I embraced it and kept going. 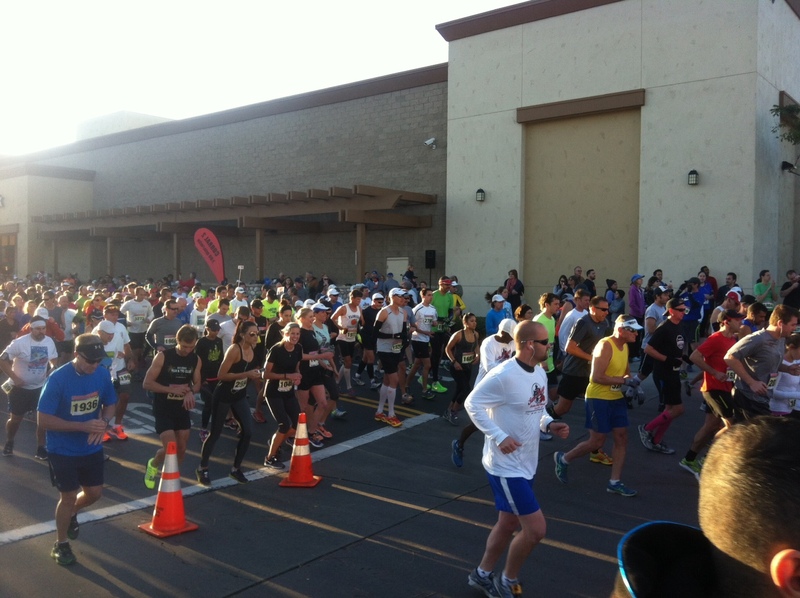 The 1:45 pacers were far behind us at this point and I knew that I was going to achieve my goal. Coming into the finish I kicked it hard and had to hold back a bit once I realized I had farther to go than I realized. Once I knew the finish was close, I kicked it again and sprinted to the finish, finishing barely shy of a PR at 1:43:34. I was a little disappointed but mostly happy that I’d performed better than expected. I ran the final 3 miles of a half marathon VERY fast and I felt better than I’ve ever felt at the end of a half. I had a huge negative split on the race and executed my race plan (almost) perfectly, with the exception of forgetting my first Gu. My final 3 splits were: Mile 11: 7:59, Mile 12: 7:24, Mile 13: 7:30, Final 0.2 Miles: 1:28 (6:42 pace). The final 5k in total was nearly a 5k PR for me! That is probably what I am most proud of. 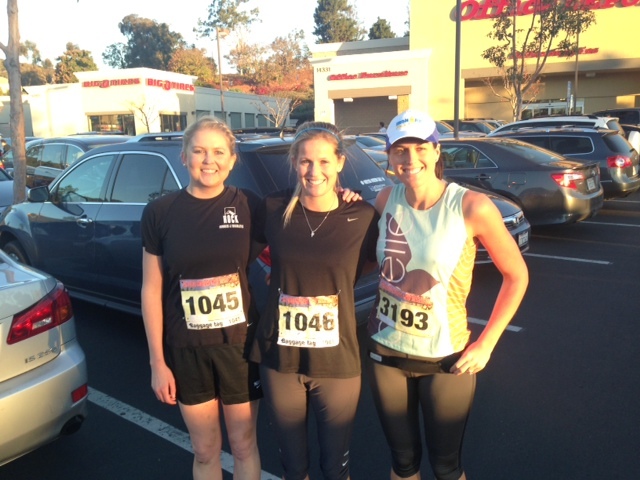 This race was not only fun but also helped boost my confidence that with 9 more weeks of solid training (8 now!) I have a great chance of getting my Boston Qualifier time at Phoenix. More importantly, this race taught me that I can finish strong and that if I’m not feeling great halfway through the race it doesn’t mean I won’t feel better. I’ve had so many half marathons where I’m really struggling in the final 5k and I’ve become used to expecting it. When a race isn’t going well halfway through, I immediately assume it’s going to just get harder. In this race, it didn’t, even despite the fact that the majority of the decline was in the middle of the race. I will be able to use this race as motivation for myself at Phoenix during those moments when I’m not feeling great and I have doubts about my ability to finish strong. 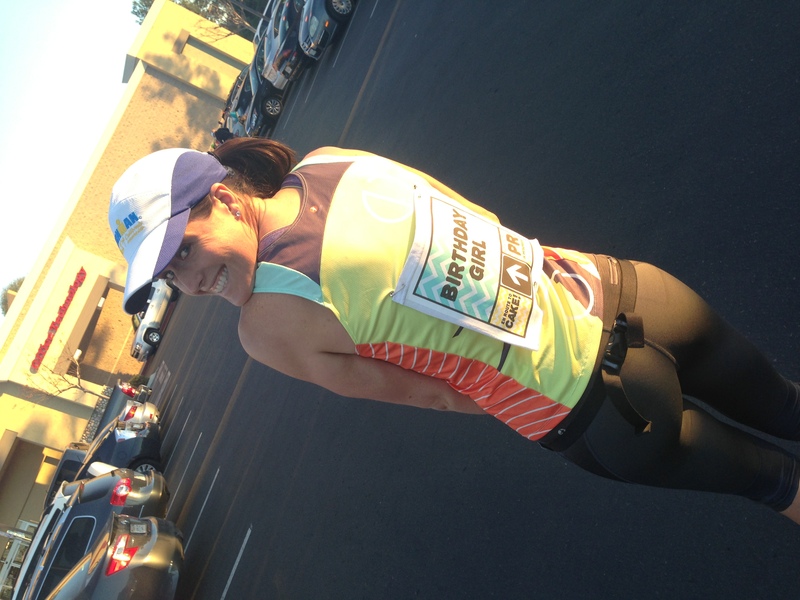 Have you ever celebrated your birthday with a race? Thanks! Vegas could beat birthday run ! I’m not sure if actually do a race on my actual birthday though… Although that’s impossible since there are no Christmas day races! Happy birthday! I love getting surprised by a great performance when I go into a race without any solid goals. You did great! Congratulations on a really well executed race! I love that you guys wore birthday ‘numbers’; so cute, and fun for crowd support! I’m glad the race went so well and helped boost your confidence. Sounds like you’re doing incredible with eight weeks left! On my 20th birthday, Kelly and I ran our first marathon together in Arizona. It was a fun/not so fun way to celebrate! Awesome race! Way to go! I’d love to hit a 1:43 at my upcoming half in 2 weeks. Just to be at 1:45 or under would make me a happy runner 🙂 Great job and so glad you felt so good. That is the key above all else and the time. Woo hoo! This is really awesome! Congratulations on a great race!! I, too always forget that sometimes when you start to feel bad during a race, it can most certainly pass. It’s hard to get over that sometimes. What a great way to celebrate your birthday! Thank you! Just gotta get out of my head! PR twinsies! Congrats! That BQ is super close you can almost touch it. Good luck and happy belated bday! Haha PR twinsies! Thank you!! Great race!! What a confidence boost going into your marathon!! I think sometimes those negative thoughts come from not having enough fuel?!? You have to keep those negative thoughts away!! 🙂 I have a super tough time with the mental side of running so I can totally relate!! Yea I do think the fueling doesn’t help with negative thoughts! I gotta work on that! RnR would be a great race for a birthday! Killer job on this race! Nothing better than the last few miles being the absolute best and fastest miles of the race!